Mediator Serif is a type family created by Alexander Lubovenko together with Manvel Shmavonyan and published by ParaType which is available in 2 widths each with 8 weights & 8 narrow slyle and italics, a wide range of OpenType features and multilingual support. It was designed to be suitable for both display sizes and body text. 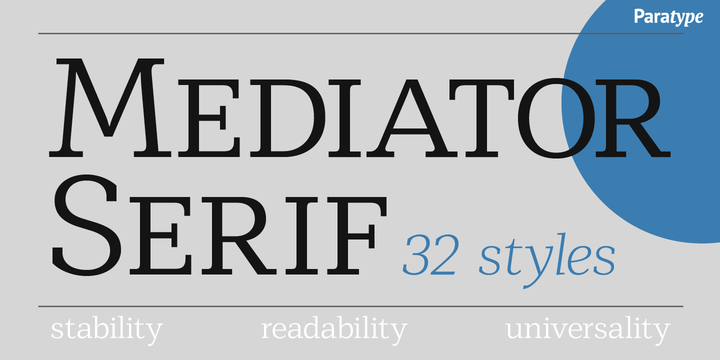 It is a complementari serif face for Mediator Sans. It is characterized by stability, readability, universality and it can be use for any kind of project, such as advertising, magazine, newspaper, text, signage etc. Cannot miss it! A font description published on Wednesday, May 17th, 2017 in Alexander Lubovenko, Fonts, Manvel Shmavonyan, ParaType by Alexandra that has 2,960 views.